From August 22 - August 26, 11 new MIT freshmen took part in Discover EAPS (DEAPS), a freshmen pre-orientation program focused on extreme weather and climate. Led by coordinator Lodovica Illari and 12 other faculty, staff, and graduate and undergraduate TA's, this years edition of DEAPS was a rousing success. The program began on Wednesday, August 22 with a lunch at which the participants were given an introduction to the activities planned for the next few days, and also got to meet several EAPS faculty. Lunch quickly segued into the first science event of the week, the much anticipated "Height of the Green Building" activity. The students ascended to the roof of the Green Building, armed with portable weather stations and infrared thermometers, where they took weather observations as well as sky and surface temperature measurements. Undergraduate TA's Erin Bailie and Reena Joubert and graduate TA Allison Wing each led a group of students for this activity. The students would use the difference in atmospheric pressure between the top and bottom of the Green Building to estimate its height. After descending to ground level and taking the same weather observations there, all eyes turned to the roof to time the fall of various objects; a second method of calculating the height of the building. Staff member Jeff Scott and graduate TA's Tim Cronin, and Morgan O'Neill dropped several water balloons, honeydew melons, and two watermelons. Following the excitement of the watermelon drop, participants went out for dinner and bubble tea in Harvard Square. On Thursday, August 23, the days events began with a talk by Prof. Dan Cziczo on his work doing laboratory and field studies of cloud formation, including a tour of his 13th floor laboratory. The rest of the day the students learned about hurricane flow. Groups alternated between a rotating fluids laboratory demonstration of an analogue to a tropical cyclone (the radial inflow experiment) with Prof. John Marshall and graduate TA's Jareth Holt and Vince Agard, and analysis in the computer lab of wind-speed data from 2008D. hurricane Bertha. Following these activities, Allison Wing gave a hurricane briefing, updating everyone on the status of several tropical cyclones around the world; including initial projections for Hurricane Isaac, which ended up impacting the Gulf Coast the following week. Following dinner on the 9th floor, the group headed off to a new addition to the DEAPS program, a visit to MIT's Wallace Astrophysical Observatory in Westford, MA. There, Amanda Bosh and the other staff of Wallace Observatory gave tours of the observatory's facilities including 24" and 16" telescopes each housed in a dome. Students had the opportunity to view various stars, galaxies, and nebulae through the telescopes, as well as see a passage of the International Space Station. On Friday August 24, Dr. Jeff Scott led of the day with a presentation on his work with climate models. Afterwards, students were back in the rotating fluids lab exploring the balance between rotation and differences in heating that lead to Earth's general circulation. After lunch, everyone piled into minivans for the trip up to Jackson, NH, where they would stay for two nights to investigate the unique weather of Mt. Washington. First though, students were able to take advantage of the clear, dark night sky to explore more astronomy, with a portable telescope brought up by Amanda Bosh. The Milky Way was even visible! On Saturday August 25, the day began with weather observations at the base of Mt. Washington in Pinkham Notch and a short hike up to Crystal Casade, where Tim Cronin described the flora of the Northern Hardwood forest. Then began the ascent up Mt. Washington's Auto Road, with a stop at the four-mile post to take more weather and flora observations. The change in scenery is quite dramatic! 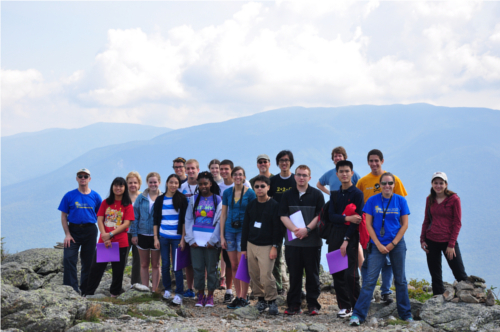 After reaching the summit, the students received a tour of the Mt. Washington Observatory, where they learned about the extreme weather conditions found at the summit. After lunch, the group headed off for a hike down to the Alpine Garden. Unfortunately the hike was cut short due to an approaching storm, but was still enjoyed by all! The day was wrapped up with dinner and ice cream in Gorham, NH. On Sunday August 26, the DEAPS group departed the lodge and headed off to a rocky outcrop, where they were led by Dr. Frank Dudas in learning about the geologic history of the area and why there is are mountains there in the first place! After a discussion on their sketches and observations of the outcrop, it was time to get on the road to head back to Cambridge. All in all the program was a great success, with the students excited to discover a bit of EAPS! This year, DEAPS expanded to a 5 day program, including a two-night stay in New Hampshire to explore the Mt. Washington environment.